This cake was for my cousin’s step-daughter. 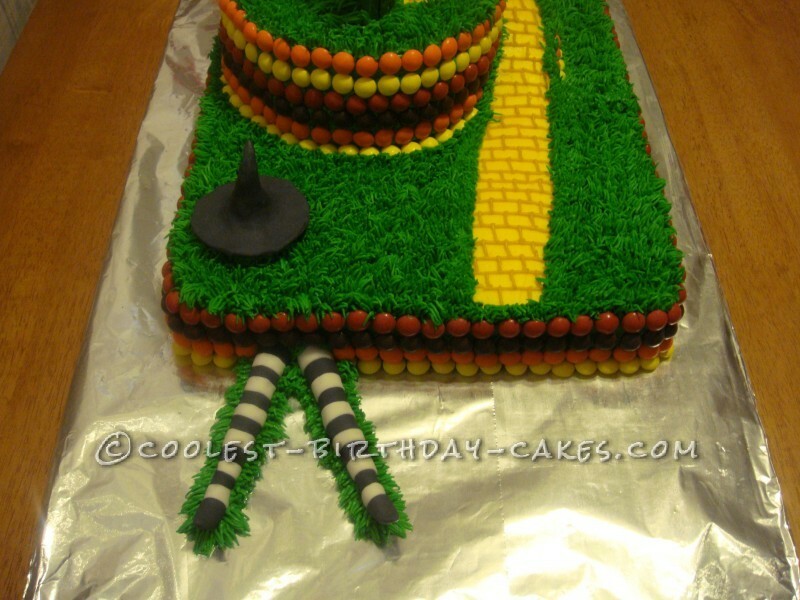 She wanted a yellow brick road cake with the Emerald City on it. 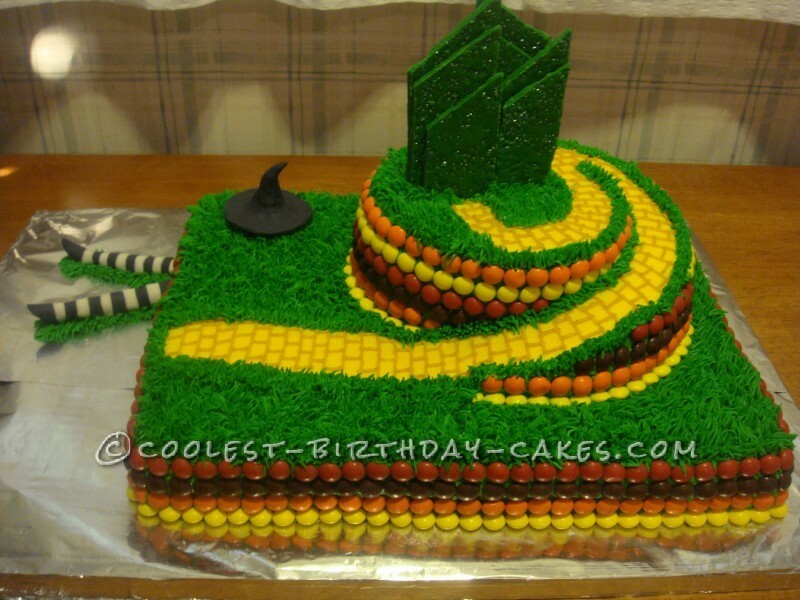 I started by making the Emerald City out of chocolate. I melted the chocolate, added some edible glitter to the pan I was pouring it in, then poured and let it dry. I used a sheet pan so that I would have thin long pieces. After it dried, I used a knife to cut (and sometimes break) the chocolate into the shapes I wanted. Then used icing to put them together in the shape you see. 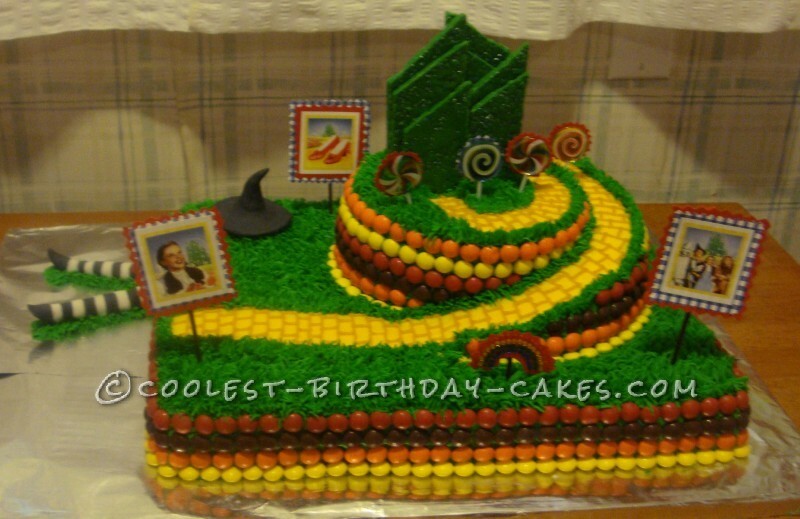 The cake was an 11×15 sheet cake with three 9″ round cake layers on top. I then started trimming the round cake. I used toothpicks so I would get it kinda straight. But I just carved like a little road up and around. For the hat and legs, the hat is just shaped fondant. The legs, I took a pair of Barbie legs from one my little girl’s Barbie’s that she didn’t want anymore and wrapped fondant stripes around them. Stuck them into the side of the cake with icing. Then I used a grass tip for all the green you see. I used skittles for the borders stuck on with icing. The yellow brick road is just drawn on. After I got the cake all together, my cousin had made some little “sticks” she wanted to put on.She used lollipop stickers and other stickers from the craft section and put them on little sticks. I love the way the cake turned out. Her little girl loved the cake also.